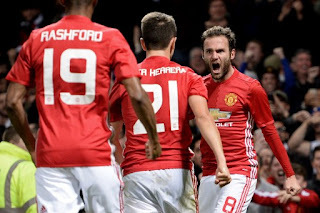 Jose Mourinho’s Manchester United were handed a home tie with West Ham United in Wednesday’s League Cup quarter-final draw after eliminating derby foes Manchester City. United saw off holders City courtesy of a 54th-minute Juan Mata goal at Old Trafford and will now entertain Slaven Bilic’s West Ham, who pulled off a 2-1 upset win at home to Chelsea. In the only other all-Premier League last-eight tie, Southampton — 1-0 victors over Sunderland — will visit Arsenal. Liverpool, who beat Tottenham Hotspur on Tuesday, host second-tier Leeds United, while Championship leaders Newcastle United visit Hull City.